Nothing is more important to management than staying within the allotted budget. Advance planning and discipline are key. Without understanding where you want to go and how to get there, costs can quickly spiral out of control. Controlling costs will become even more challenging as companies struggle to implement and comply with new e-Discovery rules and regulations. 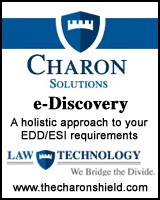 Charon Solutions simplifies the process. We take care to understand your requirements, and then put together a plan that we will manage every step of the way to make sure all milestones are achieved � on time and within the agreed budget. Perhaps your processes are already in place but you�re looking for ways to cut costs or distribute resources more efficiently. For example, if you have existing disaster recovery procedures in place, we can show you how to leverage those resources to also protect your enterprise for the new e-Discovery rules, thereby cutting costs substantially. Call us. We understand that it�s your money.